U2’s spaceship-like stage, which is the centerpiece of their “360 Degree World Tour”, landed at New Meadowlands Stadium on Wednesday. The band took the stage as David Bowie’s Space Oddity played, then launched into a 26-song set, thrilling the estimated 95,000 fans in attendance. I later read that this tied the record for U2’s longest setlist. While I have seen U2 play live at the Grammy Awards and the Rock & Roll Hall of Fame 25th Anniversary Events, this was the first full U2 concert that I have been to and the first time I’ve had the opportunity to photograph the band. The photographers were positioned under one of the legs of the massive stage structure, about 100 feet from the center of the stage, where Bono spent most of his time during the songs that we shot. Despite shooting from a fixed position and relying heavily on telephoto lenses, the band’s stage setup and rock star poses made the show a blast to photograph. Here is a link to the full gallery of the show. 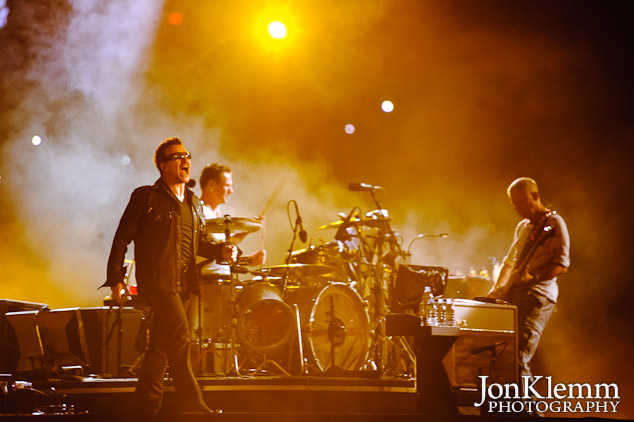 This entry was posted in Concert Photography and tagged New Meadowlands Stadium, U2.